With the surprising success of the e-book 50 Shades of Grey, it has become clear that many female readers are in search of darker, dirtier things in their daily reads. Enter The Taker, a unique and twisty literary experience. So much more than just a Twilight for adults, The Taker spans hundreds of years and tells the story of Lanny, a young woman who makes a deal with the devil to possess the man she loves. New in paperback, this exciting read is our Red Hot Book of the Week. There are times when you’re in the mood for a happy novel, a predictable love story in which the guy and girl end up together and live happily ever after. The Taker is definitely not a book for one of those moods. Instead, it’s a dark tale of love, one that blurs the line between passion and possession, need and obsession. It’s twisty and unpredictable, and the inclusion of the supernatural makes for a heady, intoxicating read. Dr. Luke Findlay is on call at the hospital in St. Andrew, Maine when the police bring in a preternaturally beautiful young woman. Her name is Lanore McIlvrae, and she has just been apprehended after shooting a man in the chest in the woods. As Luke treats Lanny’s physical wounds, she reveals to him emotional scars that cut much more deeply than anything he can bind. She tells him that the man she shot is a St. Andrew — though no St. Andrews have lived in their namesake town for over 100 years. As Luke wonders how this is possible, Lanny spellbinds him with the mesmerizing tale of her life. It can’t be possible that Lanore is centuries old, yet he can’t help but believe her. Her painful story of dark secrets, tragic romance, and the search for redemption speaks to Luke and for some reason, he finds himself wanting to help Lanny, though it might cost him everything. 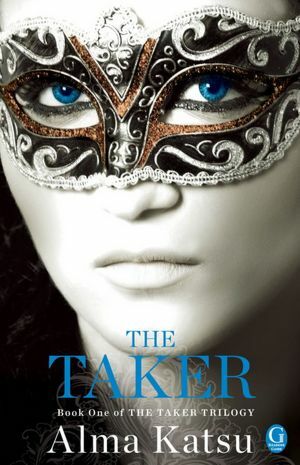 Filled with ruthless characters and sordid deeds, The Taker is the perfect read for a dark, stormy night. The writing is breathtaking and readers won’t be able to get enough of the dark atmosphere that pervades every part of the novel. This is the perfect time to pick up this bestselling debut, as the second book in the trilogy will release in June.